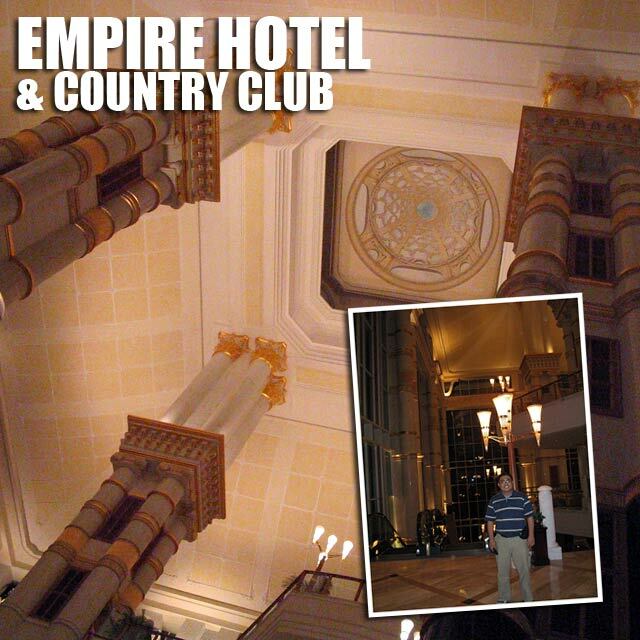 It's the 5th day of my travel retreat. After all that stress in the Philippines, I just wanted to be alone to recharge. After posting yesterday, Wandi and Yati picked me up here at Yayasan where I'm typing again today. 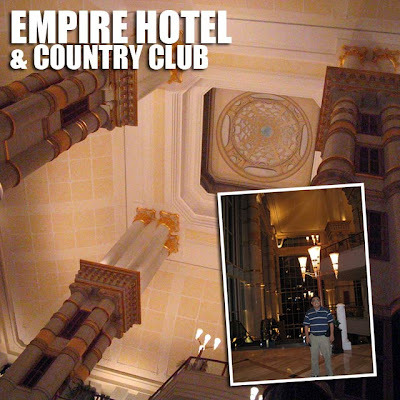 We first went to the Empire Hotel and Country Club. Talk about luxury! They said than when the hotel hosted APEC, Clinton just couldn't stop looking at ceiling even when the Sultan of Brunei was chatting with him. We then when to Jerudong Park to take a stroll in a reminder of better times in Brunei. All of us were hit badly by the 1997 Asian financial crisis, Brunei included. Dinner was at a local joint in Jerudong. We had nasi katok... chicken, with rice and sambal wrapped in paper. The name has an interesting story behind it. People used the knock in houses to buy this cheap and light meal. Thus the word katok... hehe! After dinner, we went for a drive around Jerudong since it was palace central since most of the royals chose to live there. All the luxury enjoyed by a single family! In the morning, I decided to get up late since I am on rest vacation! Had brunch at another Indian restaurant and this time took the murtabak ayam (chicken) and roti kosong. Yummy! I then took a bus to Gadong, their shopping area, but found nothing of interest. So I decided to go to the Royal Regalia Museum back in BSB. As warned, the buses were very unreliable. How could a well-developed country have a bad bus system you may ask? Well, everyone has cars so no one rides the bus! It took quite a while waiting at the bus stop, no waiting shed, it was drizzling and yet the sun was out, talk about bad luck! 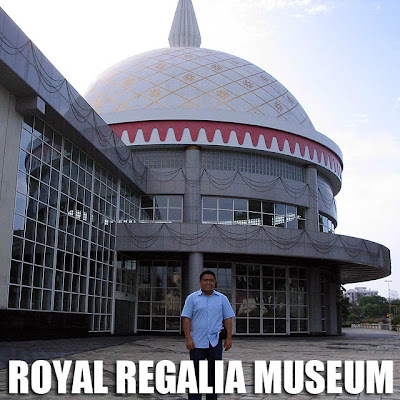 There are no entrance fees for museums in Brunei. And that is indeed a strong statement about it's economic standing! At the Royal Regalia Museum, you saw the crown jewels of Brunei and other paraphernalia used during royal functions, from the Sultan's down to the escorts. On display as well were the gifts to the Sultan of various heads of state and visitors. And as expected, the gift of the Philippines looked so pityful beside the regal presents of the other countries. It reminded me so much of SSEAYP... we could do nothing but hide our faces when we gave the gifts provided to us by the National Youth Commission. Cheap and tasteless! We said to ourselves, we should have gotten the presents ourselves. It's government, what do you exepect? There were 1998 SSEAYP presents to the Sultan on display at the museum as well would you believe. And obviously, the Philippine present wasn't on display. This should be a wake-up call to the National Youth Commission staff, if you can't buy good presents, then don't! The SIP Board could do a better job! Now I'm back in Yayasan killing time. I'm having dinner with the other Brunei PYs later. So I guess that's it again for now.